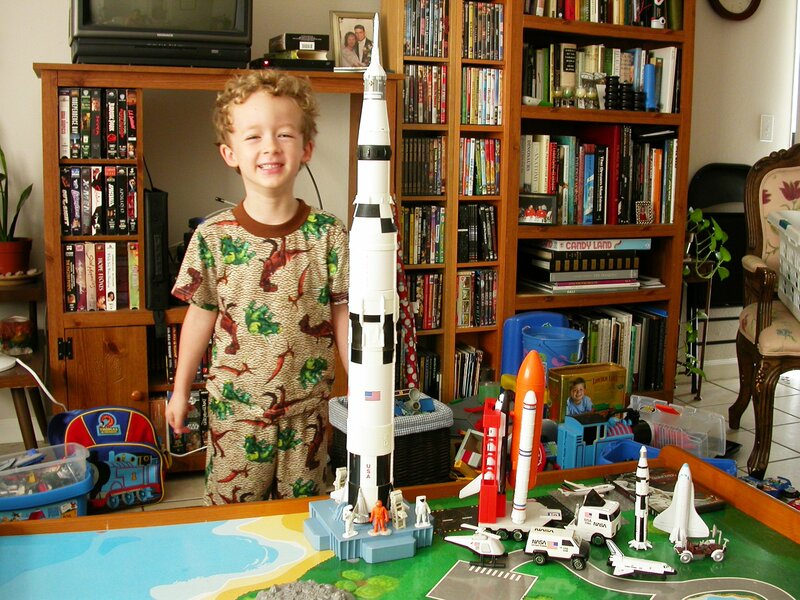 My son, London, is nuts about space. Although some of my friends don’t believe it, I haven’t pushed him toward this at all. 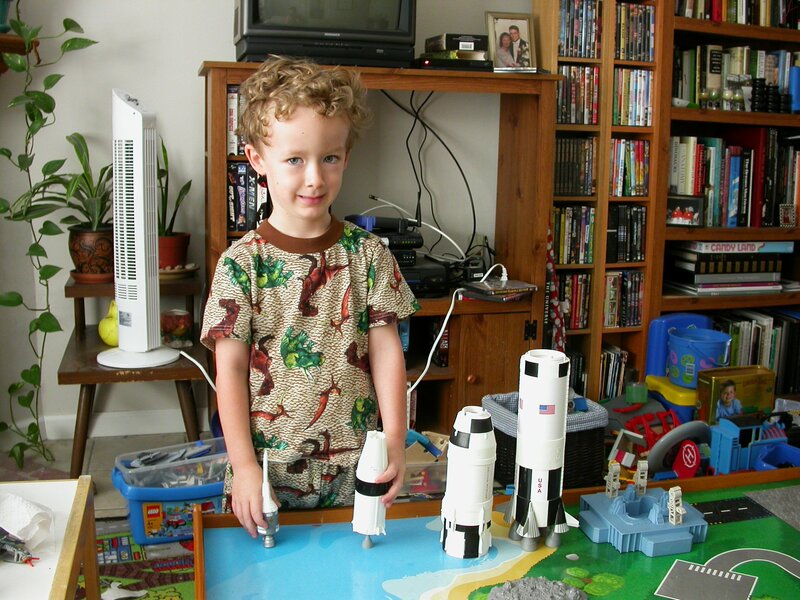 The truth is that he loves everything that goes–cars, trucks, boats, submarines, trains, airplanes, and, yes, rockets. His interests wax and wane and change focus over time. 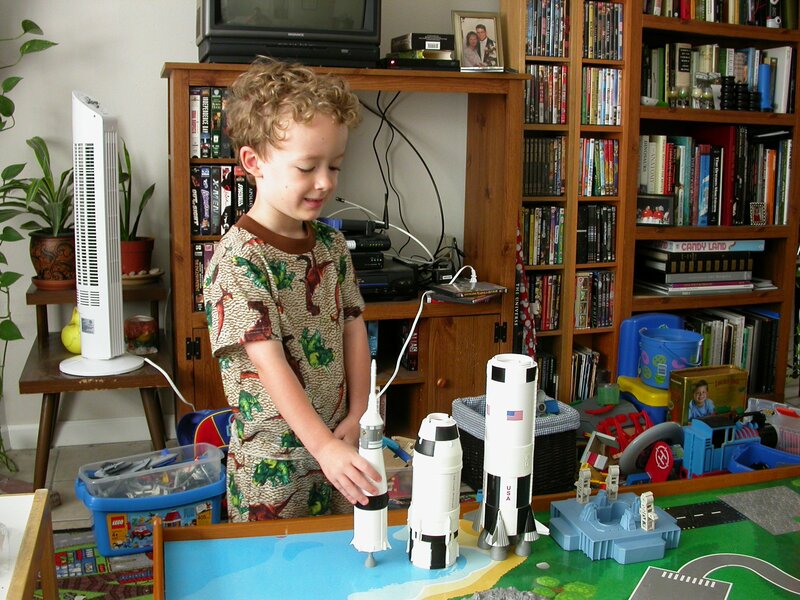 When he was younger, he was absolutely crazy about Thomas the Tank Engine (you can see some Thomas paraphernalia in the background in the above photo). 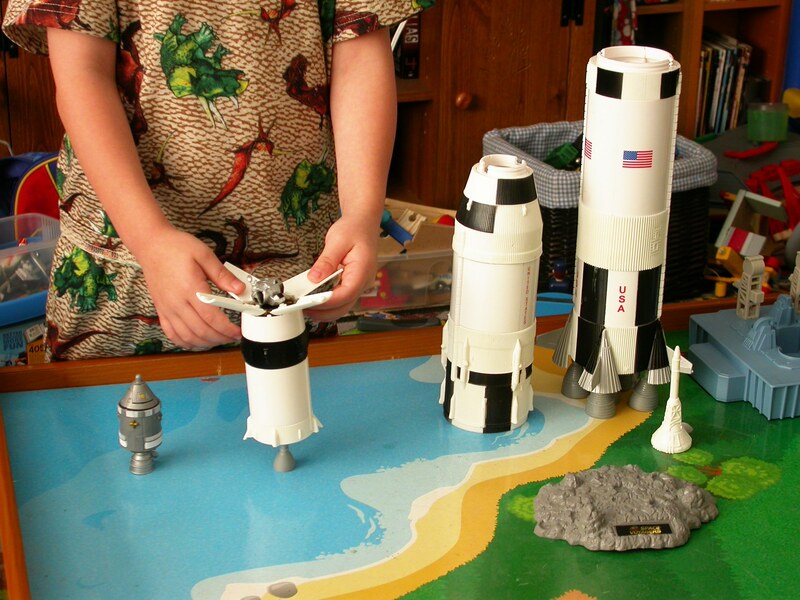 Now it’s rockets, especially moon rockets and the space shuttle. We started giving London an allowance a few months ago. We were out running errands and he saw a little toy airplane and asked if he could buy it. I started to say, “You’ll have to save your money”, but then I realized that I couldn’t very well advise him to save up if he didn’t have any money to save. 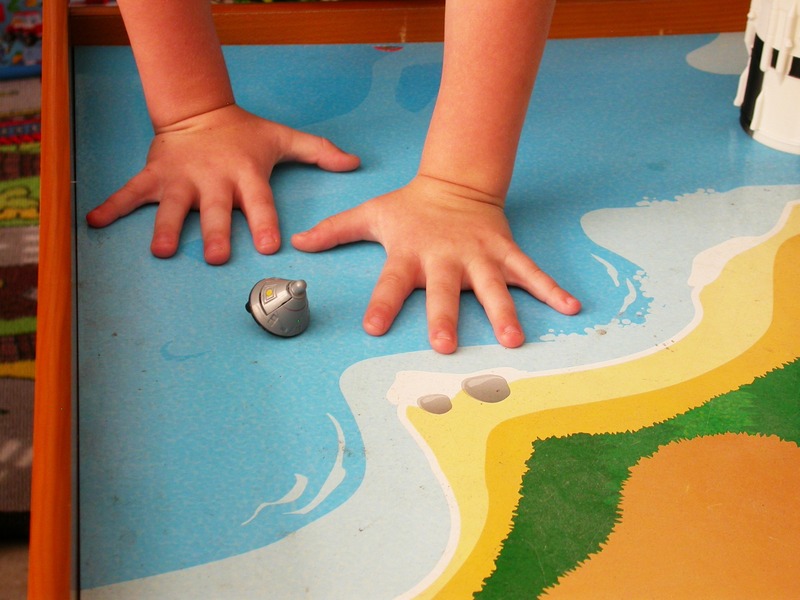 Since then, we have been amazed at his ability to delay gratification–he regularly saves up his allowance for a month at a time to get bigger, better toys. 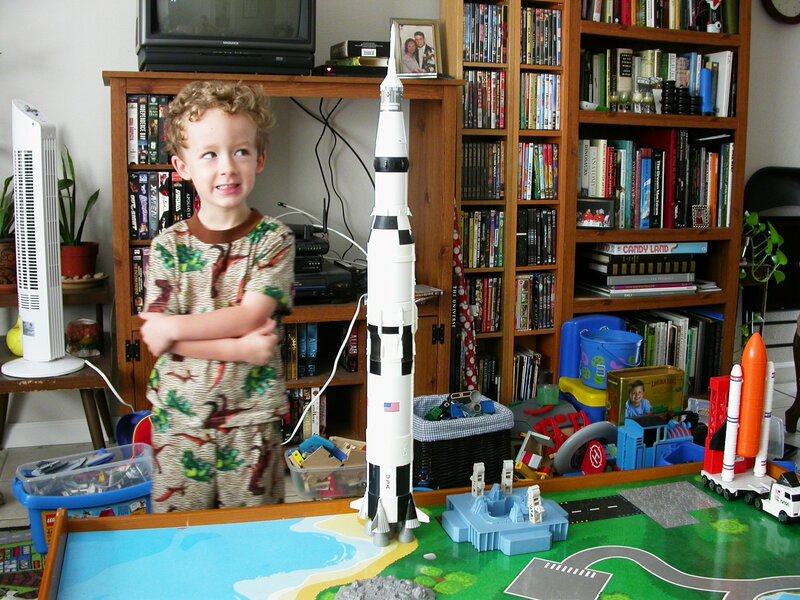 The Saturn V moon rocket shown here is one of those things he saved up for. I first discovered it on Amazon a few months ago, when it was selling for $40. I put it on the wish list and figured I might get it for London’s fifth birthday, which is coming up in November. But a couple of weeks ago I got a notice in my inbox that it was marked down to $23, so I pounced. 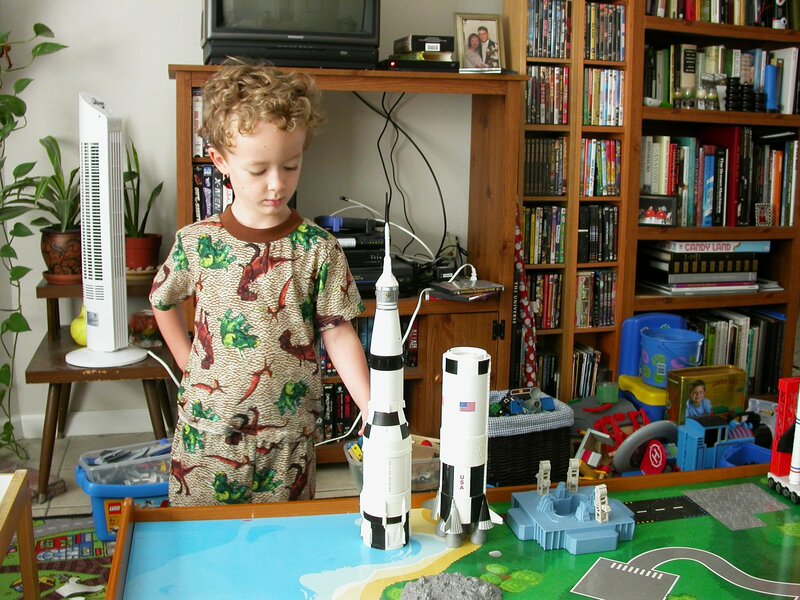 London had already saved up quite a war chest for a little Matchbox airport set, but he decided to put that off and spend his savings on the Saturn V.
I’ll be honest: I don’t have a whole lot of objectivity when it comes to this thing. I think it’s the coolest toy ever. 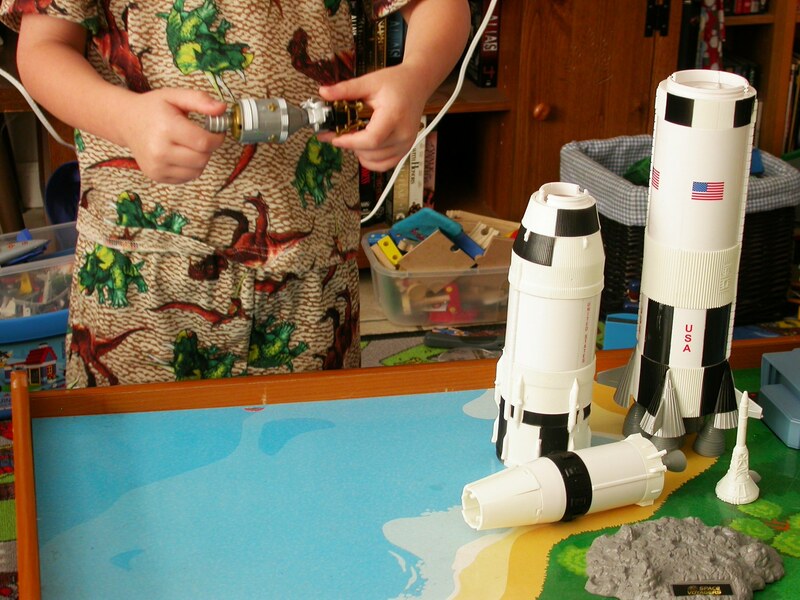 Here’s why: it’s accurately reconstructed in 1/144 scale, and every single thing comes apart, just like in real life, so you can reenact an entire moon mission in about ten minutes–and London has been doing just that, all day. Here the first and second stages have separated from the third stage. 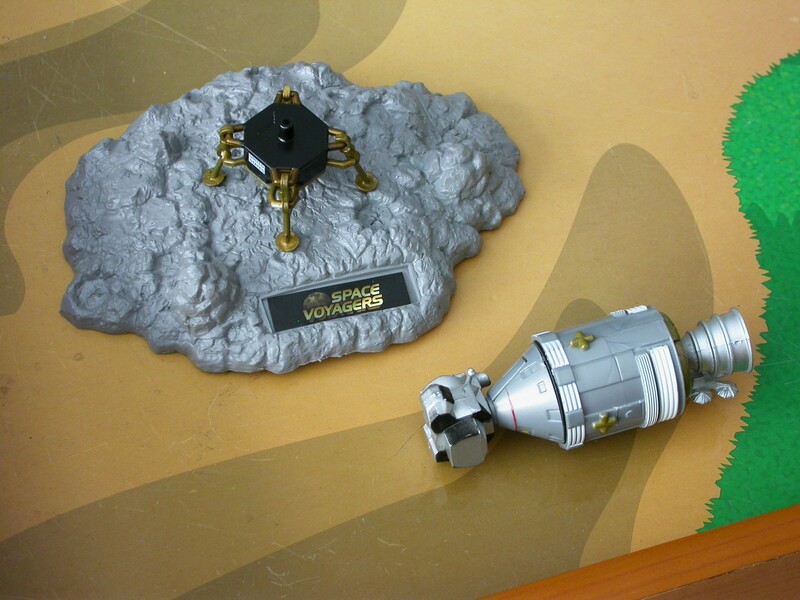 …which the command module docks to. Near the moon, two astronauts go into the LEM and take it down for a landing. The third astronaut stays in orbit in the command module. 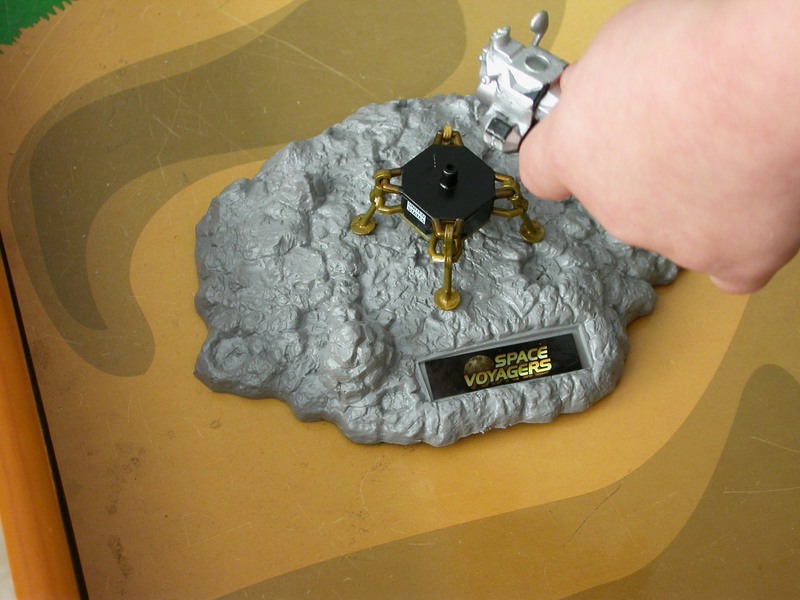 The lander on the moon. Possibly my favorite thing about this whole kit is that the legs on the LEM fold up to fit in the third stage cargo fairing, and fold out to land. 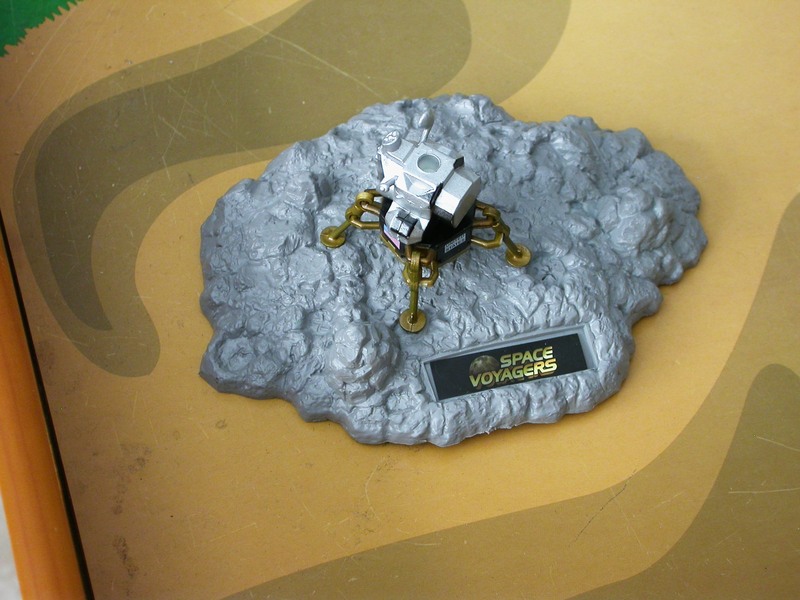 At the end of the lunar excursion, the descent stage of the LEM acts as a launch pad for the ascent stage, which takes the two moonwalkers back up to their ride home. The ascent stage docks to the command module in lunar orbit, and the three astronauts are reunited. 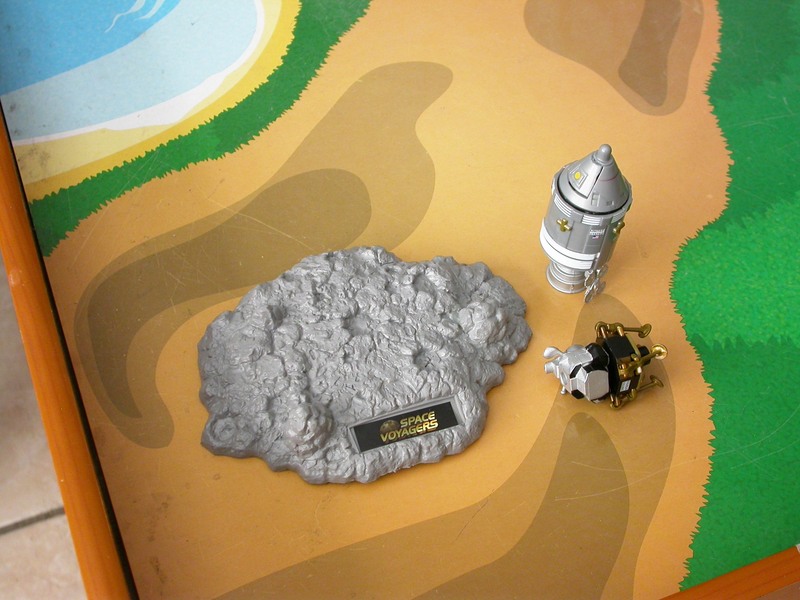 The lunar ascent stage is discarded and crashes into the moon. Nearing Earth, the astronauts jettison the service module, and command module reenters the atmosphere and splashes down in the ocean. A successful mission for the three intrepid explorers! On top of everything else, the first stage has a speaker that plays a countdown, ignition, and liftoff sequence, and the first stage shakes for ten or fifteen seconds. 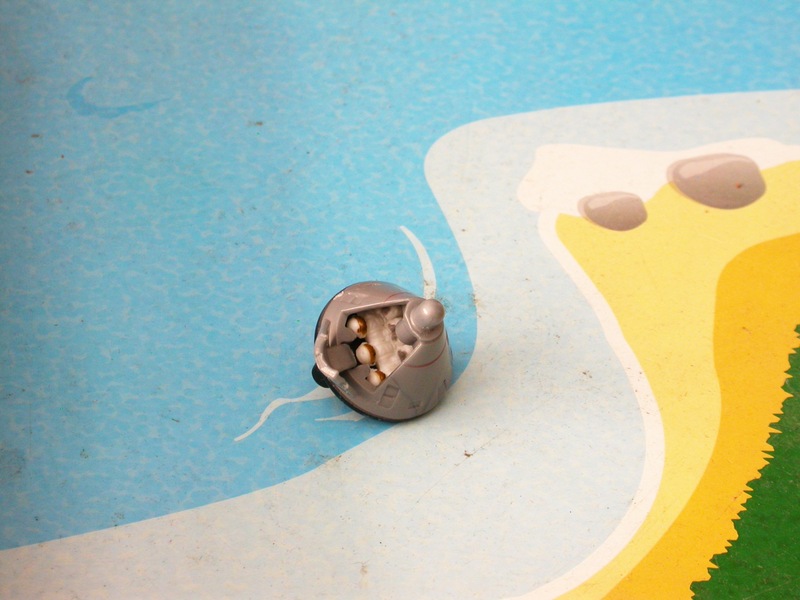 It runs on AA batteries, and the battery hatch is hidden on top of the first stage, under the realistically sculpted top of the hydrogen tank. 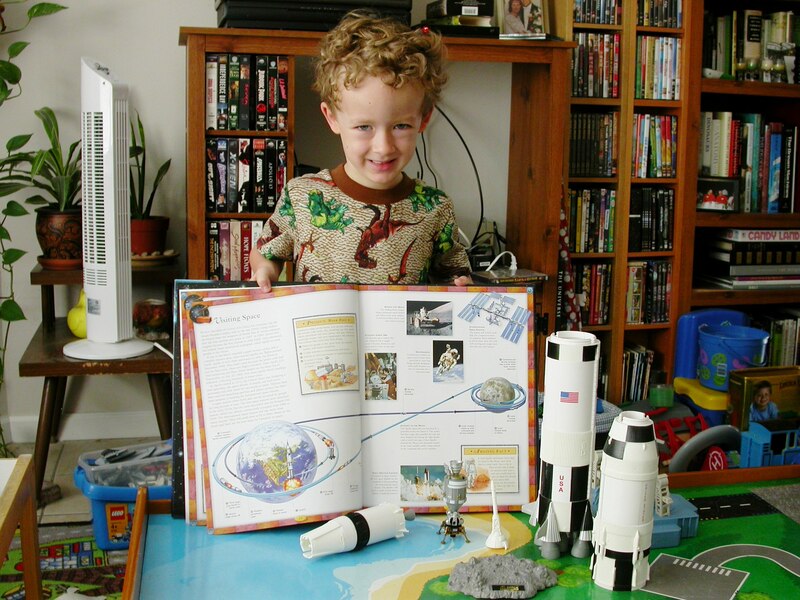 It comes with a 16-pg book that goes through all of the components and the steps of an actual moon mission, just as depicted above. About the only con on this thing is that the spring-loaded doors on the third stage cargo fairing don’t hold the service module very tightly. So if you just grab the rocket by the first stage, pick it up, and turn it sideways, the command and service modules fall out. I just have London pick up the rocket with one hand on the first stage, to lift, and one hand on the service module and cargo fairing to hold the top end together. If I didn’t have a boy to get this for, I’d be getting one for myself. The MSRP is $50, and it’s a total steal at $23. At that price, I’m tempted to buy another one just to have it. If you don’t need one for yourself, you probably know a youngster who would be gaga over it. Here’s that link again. You are currently browsing the 10 Minute Astronomy blog archives for the day Saturday, August 29th, 2009.